Is sports gambling a key to Belmont arena project success? In addition, the [governor's proposed] budget impacts local governments by cutting Aid and Incentives to Municipalities. Finally, it restricts sports gambling to the upstate casinos only. Why shouldn’t Long Islanders have the ability to go to Aqueduct, Belmont Park or Jake’s 58 to place a bet on sporting events beyond horse racing? This makes me wonder about the business plan for the Belmont arena, an expensive building with one anchor tenant, the New York Islanders, and a retail and entertainment complex coupled with it. Sports gambling could add key profits. And, as a New York Times Magazine article recently explained, sports gambling is poised to explode nationally, adding to the experience of a game, bringing in new revenue and likely new customers. Yes, there's a good chance that Belmont would seriously wound the Nassau Coliseum, as I've written. But the Belmont arena will not necessarily thrive as well as boosters project. For one thing, there's a pattern of overestimating profits even from a busy arena, as with the Barclays Center projections. 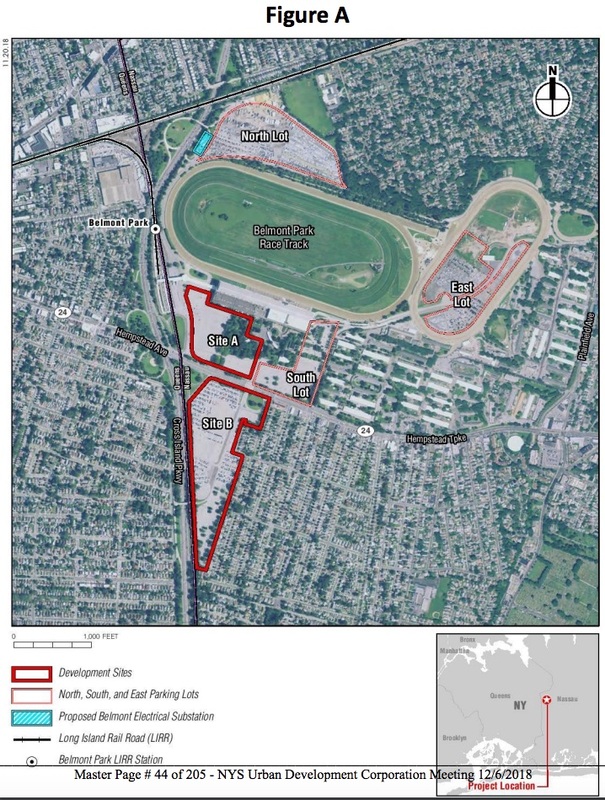 For another, the availability of Long Island Rail Road access to the Belmont arena remains up in the air; for now, those going westbound--all of Long Island--would have to ride to Jamaica and then transfer to travel east on a new train. That's not tenable for many people, and the upgrade would have huge costs; it's unclear who would pay. Then there's the question of the Belmont project design. According to the General Project Plan, Site A, closest to the railroad station, would include the Arena, experiential retail, dining, and entertainment uses, the Hotel, the Commercial Office Facilities and community facilities space, and open space, while Site B would include the Retail Village and open space. There will be both pedestrian and vehicle connections between those sites. The Retail Village will have approximately 1,500 parking spaces in a below-ground structure, while Site A will have approximately 400 spaces primarily serving the hotel, and the arena will have approximately 40 spaces, primarily serving Islanders’ team members and Arena employees. That's not enough for the fans. It's also expected that the existing parking on the North, South, and East Lots, which contain up to approximately 6,312 surface parking spaces, also will serve the arena. Fans will have to take shuttle transportation, at least from the large East and North lots. While that might be easier before an event, as long as attendees arrive at staggered hours, that portends a post-show rush as people leave as a group. That could get very tiresome. At least for those who aren't sticking around to gamble or otherwise take advantage of the entertainment complex.